The Douglas A-4 was a single-engine US Navy attack jet that first flew in 1954. It was originally designated A4D before the Navy changed their nomenclature in 1962. Designed Ed Heinemann sought to minimize size and weight. It was intended to do without wing folding, which permitted a lighter and simpler wing structure. 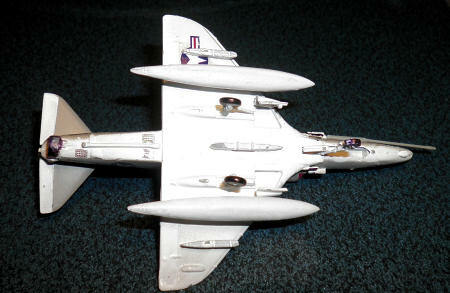 The Skyhawk’s small size allowed it to be operated from Essex-class carriers which could not support larger aircraft like the F-8 Crusader and F-4 Phantom II. The A-4 served in the Vietnam conflict as the primary USN light attack bomber. It also saw active service in the Yom Kippur War, and in the Falklands. It was called “Heinemann’s Hot Rod”, “Scooter”, and the “Tinker Toy Bomber”. The A-4 received a new lease in life as a stand-in for the MiG-17 in the US Navy’s “dissimilar air combat training” program (Top Gun). Its excellent maneuverability and small size made it a difficult target. Skyhawks served as “aggressors” well into the 21st century. The A-4E & F versions carried a dorsal ” hump” for additional avionics, but this was often removed during the latter stages of the Skyhawk’s service life. The US Navy Blue Angels flight demonstration team flew the A-4F from 1974 to 1986. I vividly remember seeing these Skyhawks at many airshows in the Washington DC area when I was a teenager. They were always the favorite of my father and I, and he has taken many pictures of them in their Blue Angel livery. As proof of the A-4’s longevity, the kit subject, A-4F BuNo 155022 flew combat in 1969, and was still in existence at Davis-Monthan in Arizona at the time of this writing. VA-164 was formed in 1960 and was deployed exclusively in the Western Pacific/ Vietnam theaters. This attack squadron served aboard the USS Oriskany and later the USS Hancock. Call sign was “The Ghost Riders”. “Lady Jessie” was Mrs. Jessie Beck of Reno, Nevada. She and her husband had befriended Richard Perry when he worked at Harold’s Club in Reno. When LT. Cmdr Perry was deployed overseas, Lady Jessie sent him and his squadron mates care packages from the casino. 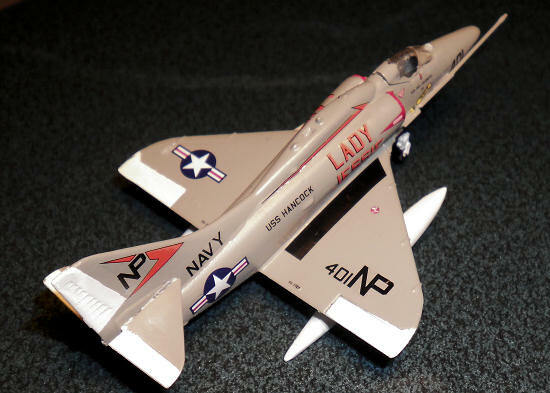 He named his plane, A-4F #407, “Lady Jessie” in her honor. LCDR Perry was killed in action on August 31, 1967. Jessie Beck continued supporting the Ghost Riders, who named their CO’s plane after her in continued tribute. The subject of this kit is A-4F Skhawk # 401, as flown in 1969 off the USS Hancock. VA-164 disbanded in 1975. Jessie Beck passed away in 1987. See Scott’s preview of this kit . The kit was built “Out of Box”. Because this is my first jet, and my first high-detail 1/144 build, my review will cover all the steps in detail, so nobody will repeat my mistakes! Step 1 - Drop tanks. Let the tanks halves dry thoroughly before gluing on the tail fins. Big plus for Platz here – they made the alignment peg/hole for the fin assemble square instead of round to insure proper alignment. ( Note: I later broke one of the fins off, and had to take them all off for symmetry). Step 2 - Main landing gear. The tires go on wedge-shaped flat pads on the gear legs, not pins. This is to keep the plane from looking pigeon-toed. Again, kudos for Platz for that extra bit of engineering. Step 3 - Wings and Fuselage. NOTE: make sure you open the holes in the underside of the wings for the pylons BEFORE you glue wing top and bottom together. The diagram for this step indicates that you glue the wing cannon in place before gluing the wing to the fuselage assembly, but I do not recommend this. The cannon are small and fragile. They could easily be broken. Let both the wing assembly and fuselage assembly dry overnight before gluing them together. Next we have the only unclear part of assembly – the joining of wings to fuselage is not obvious by the diagram. The wings have the nose gear bay built in. The gap in the nose of the Skyhawk fuselage does not allow you to snap the wing/gear bay assembly in place. What you want to do is slide the assembly into the fuselage from behind. I can only liken the movement to putting your foot into a loafer – slide it in at a slight downward angle (if you hold the fuselage upside down), and everything should fit fine. When you glue the trailing edge of the wing to the fuselage underside, make sure you clamp it good and let it sit overnight. NOTE: the guns for the wing roots (parts 10 & 11) are not identical – dry fit before gluing! Step 4 - Fiddly bits. The main problem here will be the two-part engine intakes on each side. This is where experience with previous 1/144 kits will come in handy. NOTE: the bottom of the seat will need to be filed down as it sits too high for the canopy to be closed. The horizontal stabilizers went on without any problem. I left off the engine plug (part 14) to allow me to insert a stick up the exhaust to make handling easier. I also left off the refueling probe (part 21) until the model is complete. 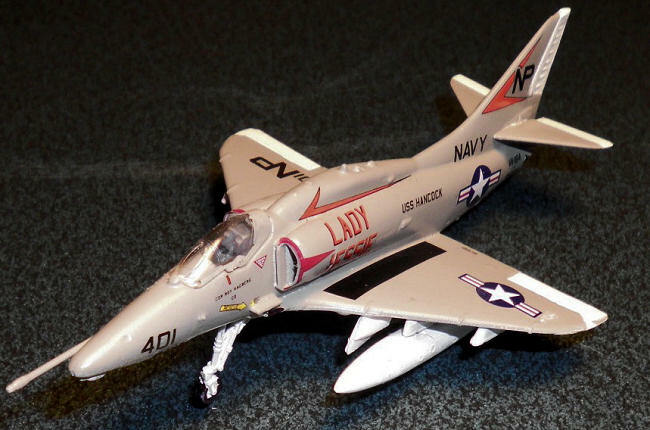 Color scheme chosen was that of “Lady Jessie” with VA-164 “Ghost Riders” in 1969, flying off of the USS Hancock. The serial number of this Skyhawk is BuNo 155022. Colors are Light Gull Grey over White, with White control surfaces. Wheel well interiors are also white. 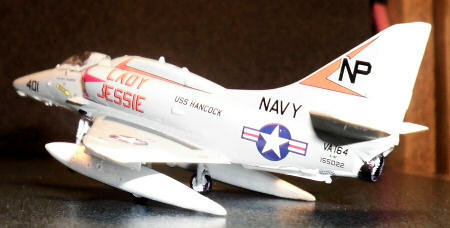 This scheme is particularly attractive on the Skyhawk. I first sprayed the model with white Krylon primer. After that had dried, I sprayed Tamiya TS-26 Pure White overall .I masked off the underside of the model, and the upper side control surfaces. Upper grey color was Tamiya AS-2 IJN Light Gray, which is very close to the USN LGG and was what I had available on my bench! A fine-line Black Sharpie was used for the tires, exhaust, and cannon. The ejection seat was painted primer gray. I took care with the decals – they are crisp and sharp, but VERY small. Look at the decal sheet carefully before cutting as some of the insignia are combined with the stenciling onto one piece of decal film. This aids in placement. Wing markings were done first. For the fuselage, my procedure is to start at the tail, working my way down one side, and then doing the same on the other side. The most difficult decals were the red markings around the mouths of the engine intakes. Step 5 – Weapons pylons and landing gear. In retrospect, these parts should have been glued to the underside of the wing BEFORE painting. My mistake, and not likely to be repeated! Fit is good, if tight. I glued the pylons first, saving the stalky and somewhat fragile gear legs for last. Adding the engine plug, fueling probe and canopy completed the model. This is an excellent, well-engineered kit of an important subject. It will make a nice addition to any collection of aircraft. However, because of the fineness of detail in this small scale, I would recommend that you have at least one or two 1/144th scale kits under your belt before tackling this one. http://www.modelingmadness.com/scotts/viet/previews/platz/pd19.htm - Retro Wings offers a “slick” fuselage conversion kit available from Starfighter Decals. This allows you to convert the Platz kit to a Blue Angels bird! Thanks to Platz for the preview kit.